Here’s a tip of the hat to Davidoff, the storied cigar maker in the Dominican Republic. Introducing one of its new Camacho blends recently, the company sent out a press release that went beyond the typical advertising buzzwords and hype. Perhaps responding to entreaties like that of Patrick A. last year, who made the case for more specific information, Davidoff went into detail. 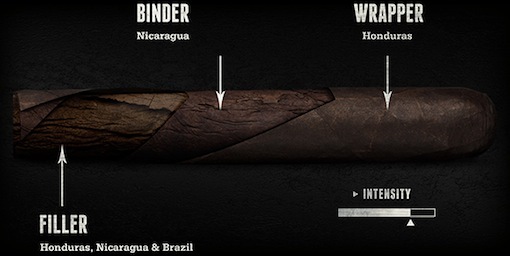 Beneath a photo of its new Blackout Limited Edition 2013 cigar that was opened to reveal the components—each labeled with country of origin—were several paragraphs packed with great specifics for the inquisitive mind. These include the production years of the wrapper, binder, and filler leaves and how long the rolled cigars were aged (two years). Davidoff also revealed where the wrapper came from on the plant and why that is meaningful, as well explaining how that tobacco was fermented. Sure, many smokers don’t care about these things. They just want to know whether they like the cigar or not. That’s fine. One of the great things about cigar enjoyment is that the field is wide open. But in this new age of great cigars and cigar appreciation, a growing number of passionate smokers crave more. They want to know a lot about what they’re smoking. And Davidoff has taken a step in the right direction. They deserve recognition and, hopefully, other manufacturers will agree. I like it! Hats off to Davidoff. Not to diminish What Davidoff is doing, but this is an evolution of what CAO did when they redesigned their website around 2006. I was in Cano Ozgener's office when he got the idea for that intensity meter that Camacho is using here (initially used in catalogs for retailers and on shelf talkers), and the graphic construction breakdowns were added when the site launched. Good on Davidoff/Camacho for expanding the idea to include priming info, and (more importantly) for putting effort into their website. Here's hoping they will maintain it (an industry wide problem). to surrounding healthy teeth because of its natural placement. Appreciate it with this wonderful content below, you realize of which health insurance and the physical fitness issues are crucial to reside in nutritious lifetime. You need to stop by southchicagoveins to learn more and also assist. Appreciate it with this good post the following, you realize of which health insurance and it is physical fitness items are necessary to reside balanced living. Remember to go to buyusapeptides to read more in addition to guide.